Watch live on BBC Two, online, mobiles and tablets - sessions at 14:00 and 19:00 both days. Live text commentary online. Defending champion Ronnie O'Sullivan says he is "buzzing" to be in his sixth World Championship final in Sheffield. The 38-year-old, seeking a third consecutive world crown, has won all five of his previous finals. "I'm just buzzing to be playing and enjoying it," said O'Sullivan, who beat Barry Hawkins 17-7 in the semi-final and had a rest day on Saturday. "To get to three finals in a row having already won two - if you'd have told me that three years ago it would've never entered my thoughts I could do it." O'Sullivan would match Steve Davis and Ray Reardon's total of six world titles if he were to win on Monday, leaving him only one short of Stephen Hendry's record in the modern era. "I would be lying if I said if I didn't think about reaching six and then seven and breaking Hendry's record," admitted O'Sullivan. "But it wasn't a goal I set myself - sometimes I think it is a long way to go and it doesn't sit well with my mental preparations. If it happens, great, if not, I've got five already. When I got to four I knew I was up there with the legends of the game so to have got five is great. To get to six would be fantastic but I still look back on my career and it is something to be proud of. "Players like Davis and Reardon took the game to the new level and it would be great to be alongside them." Hendry is the last player to win three successive titles, achieving five in a row between 1992-96. O'Sullivan, who has dropped to 33 in the world rankings because of his limited participation in overseas tournaments, had two comfortable victories in reaching the last four, with his most challenging match coming in round two when he saw off Joe Perry 13-11. He advanced to the final by thrashing last year's final opponent Hawkins with a session to spare and will take on Selby, who battled to a 17-15 win over world number one Neil Robertson in the last four. "I've still got one more match to play so I can't afford to get all excited," O'Sullivan insisted. "You build momentum with each match you get through and each match I've felt more comfortable but every match is different. "Trying to predict what might happen is pointless so I have to go out and start again. It's another match, another day and I want to enjoy what is a great occasion." Selby, who lost in the 2007 final to John Higgins, knows he is a stronger player now but faces a tough challenge against O'Sullivan. "Ronnie is a genius and he doesn't fear anyone," he said. 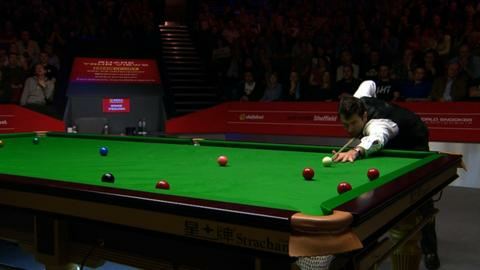 "He has played great snooker in patches but in other patches he has missed a few balls and people haven't punished him. "I will get my chances - it is just a matter of whether I can take them or not. "I'm confident - hopefully I can pull through over the next couple of days."